Family Radio Service (FRS) is a short-range, two-way, UHF radio service allocated for use by the public. Its marketed maximum range can be as far as 25 miles, but its actual range is usually closer to .5-1 mile. 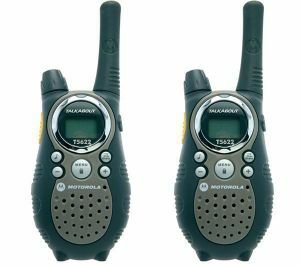 The advantage of FRS is in its compact, inexpensive radios that are excellent for communicating inside of a small area. FRS radios are limited to .5 watt output and limited to 460-462 mhtz. If you have a dual-use, FRS-General Mobile Radio Service (GMRS) unit, you may legally use only the FRS channels unless you have a GMRS license. The label on the unit or the operations manual should indicate the service the unit is certified for. FRS-only units transmit at lower power levels and have antennas that are integrated with the unit; GMRS units transmit at higher power levels and may have detachable antennas. FRS radios may not be legal in other countries. See the general rules of selecting a radio. This page was last modified on 1 April 2014, at 22:21.